Before we start, you should know a couple things about how iOS handles DNS. First, these instructions only work for Wi-Fi connections - iOS does not allow you to change the DNS servers when connected to cellular networks. Also, the changes are network specific, so you'll need to change the DNS servers every time you connect to a new wireless network. The good news is that iOS remembers the settings, so you won't have to do anything the second time you connect to a network. Tap General on the sidebar. The screen shown below appears. Tap Network. The screen shown below appears. Tap Wi-Fi. 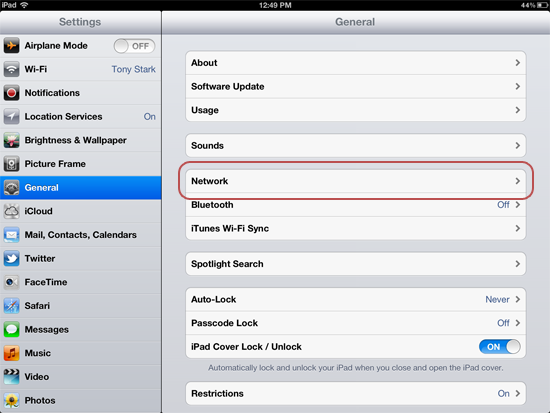 The available wireless networks in range of your iPad appear, as shown below. 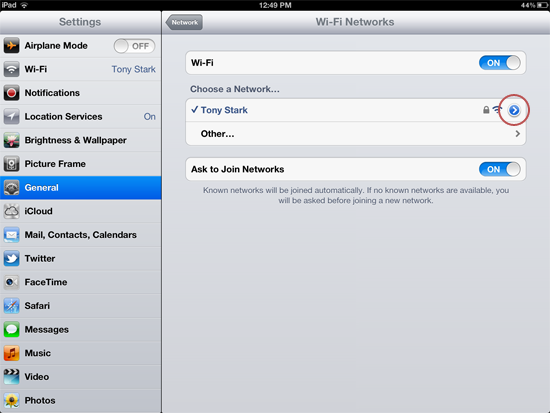 Find your wireless network in the list, and then click the arrow. The screen shown below appears. That's it! You've updated your iPad's DNS servers!